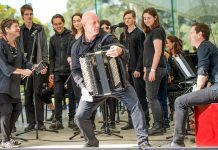 AFTER losing their funding for the SoundOut 2019 International Festival of Improvised and Experimental Music, director Richard Johnson appealed to the local artistic community for support and raised almost $9000 to keep the festival alive in its tenth year. It might be said that SoundOut is a festival where music invents itself. 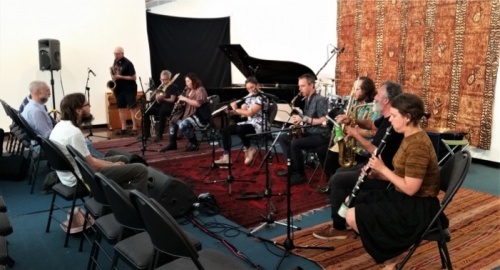 In session three on Sunday afternoon, beginning with the SoundOut Brass and Woodwind Octet, the sonic ambience and shapes of sound that eight players who “do their own thing” can create an experience like few others. But, it is clear that they do their own thing together. The varying techniques and resonances combined to make a mesmerising experience. The players listen to one another and respond to what is going on around them with their own musical information. Some look at one another and others close their eyes and listen, but also feel what they hear. 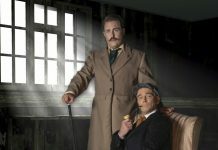 It can be as hypnotic for the audience as for the players. There’s a soothing and gentle experience in a lot of this music. It can extend into uproarious and ear-splitting pitches. The tools used to broaden the possibilities of what their brass and woodwind instruments can do range from Pringles cans, CDs, plastic bottles, a variety of mutes and to what looked like a teapot lid. All used in varying manners. In Gallery 2, Niki Johnson a percussionist from Sydney sat on the floor and played her specially built instrument. It looked like a cross between wind chimes and tubular bells, played with small mallets. The mesmerising and intoxicating sounds she produced reminded this reviewer of Indonesian Gamelan music. After an interval, a quartet on piano, percussion, violin and invented and electronic instruments brought a new sound dimension into the gallery. The room-filling ambience complete with shaking sticks swirled around the percussionists head for several minutes, could have been created for the soundtrack to a horror movie; it was creepily effective. The percussionist, Lenny Preston from Canberra kept the audience fascinated with his various techniques and sounds. The music created by this quartet proved what any good orchestrator knows, and that’s the blending of tone colours is what makes up a large part of good music. The others in the quartet were Brian McNamarra on invented and electronic instruments, Cor Fuhler, piano and Melanie Herbert playing the violin. Back in Gallery 2 for Jim Denley on wind instruments and Christian Marien from Germany on drums. The duo brought in another new sound sculpture that seemed to oscillate around the small room. At one-point sounding like Indian street musicians. Every few minutes they seemed to find ways of inventing new sounds. This is what SoundOut is about. Bringing new sounds to audiences and exploring the possibilities of what music can be. Hopefully, next year SoundOut will get the funding to keep bringing these local and international acts and their exotic sounds to Canberra.